Decking shelter for your outdoor stuff! 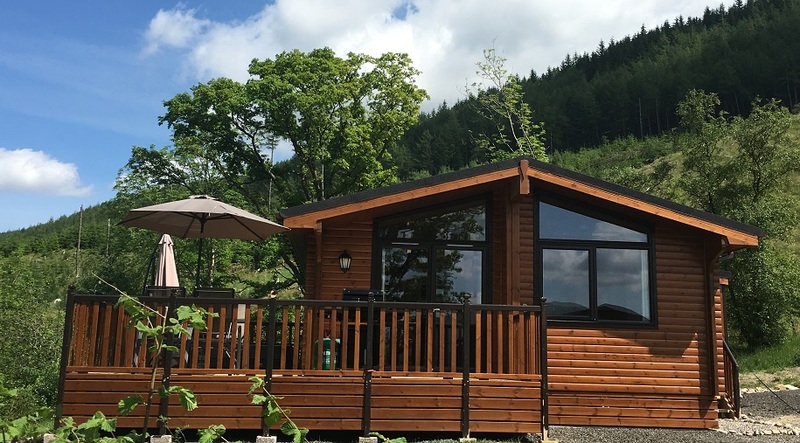 Luxury Scottish Lodges set in the heart of the Trossachs. 6 Berth or 4 Berth Lodges available. Pet friendly options. Situated in an elevated positions, nestling in forest and woodland with stunning views around the southern highlands. Located near to local amenities at Callendar, Strathyre and Lochearnhead. 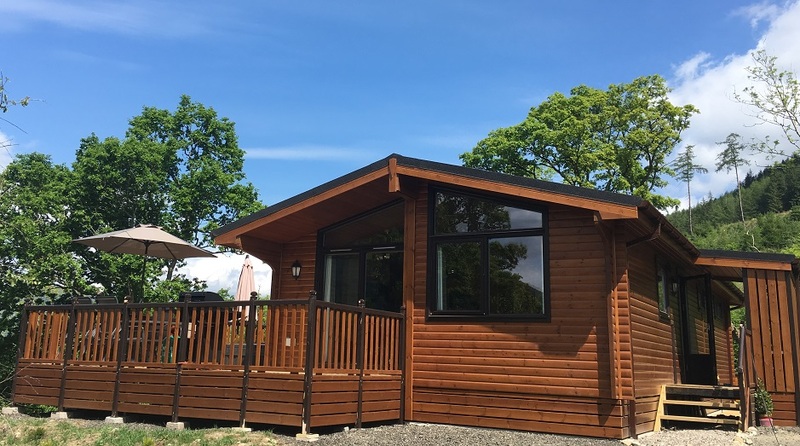 An ideal forest holiday location to enjoy the vast range of activities on offer in the Trossachs and Loch Lomond national parks. Now been here a few times now & booked again to go back next year. The cabin is gorgeous, very tastefully decorated , everything you may need for your stay is there for you. The hot tub is just perfect. I cannot recommend this place enough ! THIS place is really something special! THIS place is really something special! All the finer touches with the decor and furnishings just added to the luxury of the cabin and hot tub and the views were sensational. highly recommend. we will be back! Ros was so attentive in messaging us to make sure if we needed anything. 5 stars. What a wonderful stay. This lodge is fantastic, it's a little bit of heavan in the hills with a glorious hot tub. All the finer details added to setting. We will be back! Perfect from start to finish! The lodge (and especially the hot tub) is absolutely amazing! The lodge (and especially the hot tub) is absolutely amazing, simply cannot recommend it enough. We're already planning our next visit as we were so impressed with the whole place. We had the cosiest, most relaxing quality time! A perfect place to stay! The place is outstanding, a perfect place to stay. Everything is nice and tidy, there are many sweet touches for the guests such as games, travel guides, books, the kitchen has many handy tools. And the views are perfect from the hot tub! Pictures do not do this justice. Absolutely beautiful cabin and area . Would live there if I could would recommend this to anyone ! 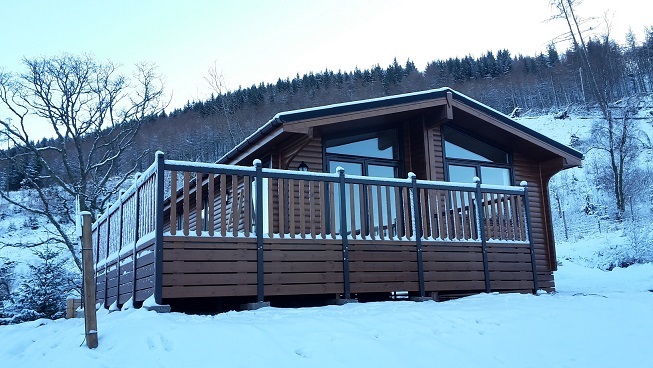 Lovely chalet close to Callander. It had everything we needed and more. Beautifully furnished throughout. Fantastic hot tub. Great walks nearby. You can walk to Mhor 84 for good food, although the chalet has a great kitchen. Really secure for dogs. So good we booked again !! We had the most amazing Christmas at the lodge , it was beautifully decorated with a Christmas tree and lights, Ros even left a present for our daughter to find on our arrival. The lodge was perfect and all of our needs were catered for. The view was beautiful and could be enjoyed from the hot tub which was maintained & cleaned throughout our stay. Thank you Ashley and Ros for an unforgettable Christmas we will most definitely be back! Well equipped, clean, comfortable and finished to a high standard. Owners have thought of everything needed for a relaxing stay. Beautiful views, nice walks. Recommend Mhor 84 for food and the Store next door is definitely worth a look. Don’t usually post reviews, However. Just spent 4 days in one of the luxury lodges with the hot tub. The lodges are finished to an extremely high standard with every home amenity you could need. The lodge slept 6 comfortably and the owners were happy to accommodate our 3 boisterous beagles. There are a number of pubs/restaurants nearby and great cycling and walking routes. I would highly recommend the Balquidder Mhor Log Cabins for families looking for a short break. Lodge is lovely, and decorated to a high standard and very clean. Views are amazing and the hot tub is one if the best we have had on a holiday. Lodge has everything you need down to the shampoo and conditioner. Can walk to Mhor 84 ( great food) and a short drive to Calander. If looking for a chilled holiday here is the place. Looking forward to our next say. What can I say, cabin was beautifully furnished to a high standard, spotlessly clean, everything there that you could possibly need, hot tub being the icing on the cake, we were sitting in hot tub with the snow coming down! 😂 Superb weekend and have booked again to go back next year, owners couldn’t be nicer and very helpful. We stayed at the Soghail cabin for 2 nights in November as part of our mini-moon after our wedding nearby. The cabin is beautifully decorated, cosy & warm, and the hot tub is bliss! The views from all sides of the cabin are gorgeous, we loved watching the local red squirrels forage up and down the surrounding trees. Ros was great and sent us all necessary details well ahead of time and even checked in with us via text on the day we arrived to make sure we were happy with everything. We’ll definitely be back to stay again soon! This is a wonderful place to stay - the lodge is finished to a high specification, Ros is an attentive host and the surrounding countryside is beautiful. Wonderful walks and lovely to have a hot tub on hand to soothe sore limbs! Perfect log-cabin in a beautiful setting! The four of us had a wonderful time here, it was very special! The hot tub was certainly the highlight and I would recommend this property to anyone! This lodge did not disappoint on any level. The location and views were perfect. The owners have spared no expense it making this a luxury retreat. There is everything you could possibly need. Normally when we self-cater I feel like I take half my kitchen with me - you really don't need to here! It's cosy, warm and as beautiful as the scenery is, some days we felt we just wanted to stay in and enjoy the lodge! Needless to say the hot tub is a real bonus. We enjoyed every night out there, enjoying the stars and sometimes the rain! We would love to stay again if we got the opportunity. Ros the host was also very attentive and helpful when we did have a query, so thank you Ros for making it all so enjoyable! I stayed here with my three friends for two nights and we had a fantastic time. We spent the majority of our time in the cabin as it was just such a lovely space. We also loved the hot tub and the views. Amazing stay! The star of the stay was the hot tub! The hot tub is a game changer! The host is extremely helpful and quick to respond to questions. The lodge is lovely, clean and bright, but the game changer is the fantastic hot tub. A lovely place to spend a weekend. The cabin has everything we would need and more! They have really thought of everything to make your stay as stress free as possible, cosy, quiet, private, clean and with the a beautiful view. the jacuzzi was the perfect way to relax from our busy work lives. We can't wait to book our next trip. The lodge was fantastic ! Spacious, cosy, stylish, spotless and well equipped. The hot tub soothed the tired feet! A very comfortable, well-equipped and luxurious lodge for a special 60th birthday celebration. We enjoyed days out at Loch Katrine and Loch Lomond on a sea plane excursion, and then came back to cosy dinners, champagne...and the wonderful hot tub. Thank you for providing the perfect venue for such a memorable and special time. An absolutely amazing place to stay! An absolutely amazing place to stay! Excellent hosts who are happy to help at any point with anything you need. The lodge is home from home with everything you need. Perfect holiday! Very well equipped cabin with quality products throughout and very well presented. Everything had been thought of down to the very last detail, the best equipped cabin I have stayed in. Plenty of space even with six people and one dog. Comfortable beds with enough wardrobe space. Nice bathrooms with very nice soaps etc. and again, quality towels. The hot tub was superb and we were in it as often as we could, what could be better sitting outside in Scotland as it starts to get dark and colder chatting to friends and having a dram........perfect. If we can we would return again. I had to contact Ros on a couple of occasions and my queries were handled quickly and efficiently. Based on our stay I would highly recommend a visit. This is one of the most beautiful,well equipped places that I have ever stayed. It is very well decorated and clean, I thoroughly enjoyed my stay and will definitely return. Amazing accommodation, beautiful place, very clean and organised. Host messaged us to confirm everything was ok at arrival and offered help at any time should we needed anything. Very good experience, we had an amazing short break! We had amazing few days! Spotless clean, comfy and stylish place! Hot tub ads even more to the place! This lodge is beautifully decorated, cosy and very well kept. Ros, the owner, is very helpful and will do everything to ensure you have everything you need to enjoy your stay. The kitchen is very well equipped and the hot tub is just lush. The view from the balcony is also amazing! We very much enjoyed our stay and would definitely book again! My girlfriend and I loved our stay at the lodge. It was very luxurious, modern and well equipped. The hot tub was amazing with great views. We would definitely come back and have already recommended it to friends and family. Ros, the owner, was very nice and helpful and getting the key and finding the lodge was very easy thanks to her. The location was great and Ros was also very helpful in providing local information about things to do, places to go and see. Overall, we had an amazing time and totally recommend it! We have stayed at many self-contained cottages over the years and Balquhidder Mhor exceeded all of them. Not only was the location perfect in terms of ease of access from Edinburgh and Glasgow, it was also extremely quiet and private. The layout, cleanliness, and comfort of the cottage was top class. It was stocked with more than just basics in terms of kitchen goods and what was most impressive was the care take with extra amenities such a house robes, slippers, coffee, tea, and many other items. Something overlooked by most. It's the details that make the difference between good and great and Balquhidder Mhor knocked it out of the park. I would recommend this as a place to stay. We loved to stay in this house - beautiful view, the jacuzzi was really cool. For those guys, who read these lines and think about to booking - DO IT! Relaxing time in amazing scenery! We had a two night weekend break at the Soghail Luxury Lodge at Balquidder Mhor Lodges. Had a very relaxing time in amazing scenery close to main routes and easy access to visit Perthshire. Lodges are beautifully kitted out and so clean. Hot Tub was up and running as soon as we got there. Any questions we had were quickly dealt with, and there's loads of helpful info provided at the lodge. Even spotted the elusive giant white rabbit that roams about – anyone else spotted it? Fantastic Lodge with everything you need ! Had a fantastic stay, lovely lodge hot tub was great after our Mhor Run to relax. Lovely walks, great views, very clean and had everything for our stay. Will book this lodge again can't wait to go back,just hope weather will be better for us to enjoy the outside space. The best short break I've ever had! It was one of the best short break that I've ever had. Wonderful scenery and a beautiful cabin and hot tub. i also like how you get free Netflix there to. i can't say a wrong word about the accommodation. Fantastic lodge with everything you could possibly want and all top quality and spotless. Hot tub is amazing as are views from hot tub and large elevated decking with recliners and table etc. Dogs loved the off road walk to Mohr 84 pub but take midge repellent for the walks. Will definitely be back ! From the moment we arrived we were already sad to have to leave! Beautifully decorated, stunning views, fabulous hot tub and every comfort thought through. 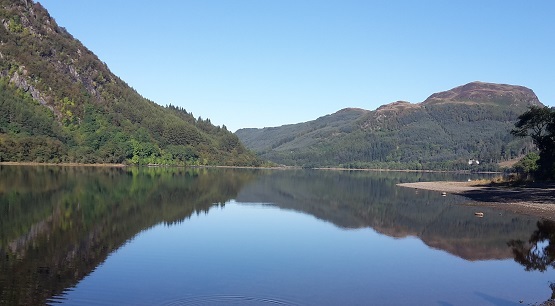 The location is ideal for exploring the beautiful Trossachs. So much to do that we were spoilt for choice. Admittedly we were blessed with amazing weather, however we would have loved it even in the pouring rain. This lodge is incredible, really scenic and perfect location! We were also very impressed with how clean and comfortable it was. A fantastic place and we would highly recommend! Beautifully decorated lodge with everything you need from brochures with activities and things to do, robes & slippers for the hot tub, tea & coffee supplies and a chest filled with blankets and board games. Definitely booking this little hidden gem again. We had the best of times! Could not have wanted for anything. They were great we had the best of times and can't wait to come back which we're doing as soon as possible. Our 2nd visit & still looks as fresh & perfect as our first. Perfect luxurious base to explore the area, however when you see this place you may just want to stay here, crack open a bottle & enjoy the fabulous views - from the luxurious lounge or the fabulous hot tub. This time we had a great walk down to Strathyre & supped a few drinks in the friendly pub (with open fire) before deciding to get the wee bus back up to cook our dinner in the super kitchen. Last time we made the much shorter walk to & from the excellent Mhor 84 Bar / restaurant to eat out. We will be back - again & again! Had a fantastic time at the Balquhidder lodge! We spent 4 nights here for our honeymoon this week and absolutely loved it! Myself and my husband thought the lodge was to the highest standard decor wise. The hot tub was the icing on the cake. Ros and Ash were so friendly, they helped us with any issues or questions and could t have been more helpful! Lovely people and lovely lodge. We will definitely be coming back for our anniversary! What can I say, beautiful lodge in a cracking location. Got home today after a 3 night stay and can't recommend it enough! First of all Ros is excellent, great communication even before we got to the lodge and also sent us a text during the stay to see if we had any issues (which we didnt). The lodge is kitted out with everything you need for your stay, all you need to bring is yourself and food! Lots to do around if you like a good walking and sightseeing break and not too far from Stirling or even Glasgow to do a day trip. Personally I recommend the Mhor84 restaurant just down the road for a great meal. Will definitely be returning to Balquhidder Mhor Lodges, Can't thank the owners enough. Set in beautiful surroundings with views of the mountains this was excellent. Everything you needed and more for an amazing break. The views from the hot tub were stunning and if you were lucky you could watch the deer and red squirrels. Ros and Ash were lovely and made sure you have everything you need. My only complaint was that we had to leave . Definitely stay again absolutely loved it. A Christmas present for my elderly parents. We set out with trepidation, taking account of Weather warnings. We arrived early and drove through the snowy entrance and up the hill to Lodge 12. The lodge was very clean, heating was on and very cosy. We had intended eating at Mhor 84 but took the decision just to stay in and make dinner and have one or two glasses of wine. The kitchen had everything you could need and cooking dinner was a breeze. The sonos speaker was great as It was easy to set-up and then play songs from my mum and dad's past. We used the hot tub twice and although we had to dig a path through the snow, once we got in it was perfect. All in all this Lodge is excellent. I also appreciate that Ros checked by text or email that all was well and that we had everything we needed. Our stay at Balquhidder Mhor was absolutely fantastic and we really cannot recommend it enough. From the moment we entered the log cabin, we felt at home. There wasn’t a spot of dust to be found, everything was beautifully furnished and the cabin was extremely well equipped. We feared that with it being late December that the cabin would be rather chilly but there was a Nest thermostat in the living room that heated all rooms and kept us extremely warm which suited us given it was -5 outside for the majority of our time there! The hot tub was, of course, one of our favourite parts about the accommodation. It was very well maintained and had regular maintenance checks throughout our 3 night stay to ensure it was working to full capacity. Ros was extremely helpful from the very beginning of the booking process to the very end. Any questions that we had she would answer within about an hour of an email being sent and she even made sure that a Christmas movie and a Christmas card was waiting for us on our arrival. We are already looking forward to planning our next stay! Just back from a fabulous surprise weekend break at Balquhidder Mhor Lodge with my family where we celebrated my 60th Birthday. The location was perfect with breathtaking views in all directions The log cabin was total luxury, from the cabin layout and decor to the hot tub you could not ask for better. The experience is one I shall cherish forever and will definitely be booking another trip. Beautiful cabin and wonderful views! Had an amazing stay at Balquhidder Mhor Cabin, was much more than we expected! Lovely decor, super comfy and loved the hot tub especially! Great views, perfect location and lots of lovely walks to go on, will most definetley be back! Thanks for having us! Stayed for 3 nights in September and had a fantastic time, the lodges are incredibly well furnished in a fantastic style and equipped with everything you could possibly need for your stay. The location is also superb, its picturesque, quiet but well located to access the Trossachs, West Coast and even a day's trip out to the Cairngorms. Would definitely stay again. This was our second visit to Balquhidder Mhor and will not the last! The lodge is tastefully decorated & the kitchen is fully equipped with everything required. Returning to the hot tub after long walks was perfect. Hope to return again later in the year. Thanks so much Ros! We have Just returned from a very relaxing weekend break, booked as a family get away for my mother’s 60th birthday. Everything about this lodge is faultless, every detail is thought of to make your stay as easy and luxurious as possible. We loved how private it was, the deck/hot tub area over look field and beautiful mountains making you feel completely secluded even though there are other lodges near by. We will definitely be returning. Thanks again for a lovely stay! We had a lovely relaxing time here . The lodge is beautifully decorated with everything you need for a break. A real Home from home . it's spotlessly clean and the hot tub is great . Would highly recommend this lodge . We will be back . Our stay at Balquhidder Mhor was absolutely fantastic and we really cannot recommend it enough. From the moment we entered the log cabin, we felt at home. There wasn’t a spot of dust to be found, everything was beautifully furnished and the cabin was extremely well equipped. We feared that with it being late December that the cabin would be rather chilly but there was a Nest thermostat in the living room that heated all rooms and kept us extremely warm which suited us given it was -5 outside for the majority of our time there! The hot tub was, of course, one of our favourite parts about the accommodation. It was very well maintained and had regular maintenance checks throughout our 3 night stay to ensure it was working to full capacity. Ros was extremely helpful from the very beginning of the booking process to the very end. Any questions that we had she would answer within about an hour of an email being sent and she even made sure that a Christmas movie and a Christmas card was waiting for us on our arrival. We are already looking forward to planning our next stay. A truly luxurious get away! Beautifully put together and lovely views surrounding the place. We felt so looked after during our stay and had someone out to help us with the hottub within 15 minutes of an email query. We were impressed with this place from start to finish and would highly recommend if your looking for a country break. We had a great stay here. It was dark on our arrival. Driving up with a blanket of snow on the ground -2 temperature & seeing the lodge & Christmas tree lit was just gorgeous. Cosy, homely interior with all needs catered for, we ditched ours bags & straight into the hot tub under the stars. Can't wait to go back. Stunning views with luxury living! The Lodge Surpassed Our Expectations! The lodge surpassed our expectations - it is immaculately furnished and immaculately clean in a lovely setting with every convenience you could wish for. The hot tub was just perfect for an early morning dip as the sun came up or in the evening looking at the stars. Ros was easy and quick to communicate with and helpful throughout. We can't wait to return! From start to finish this was a great holiday. Booking was quick & easy, straight forward and communication with Ros was great. The lodge has everything you could need for a self catering break. It is so beautifully decorated and cosy. 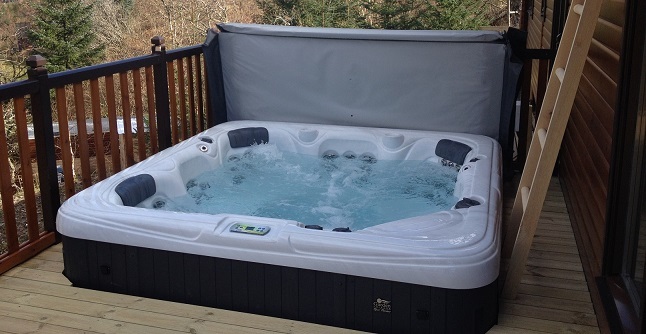 The hot tub is superb, just what you need after a day out in the Scottish hills,a long soak with a glass of bubbly!! This lodge is in a great location for exploring the Trossachs,stunning views around every corner. We loved Balquhidder-Mhor. We visited the Teaghlach Lodge last weekend (17-19 November 2017). We arrived in the dark and had a little trouble finding which lodge was our one. The owner, who I called, was very helpful and directed us directly to it. Going forward some lit signs or lodge numbers near the road is perhaps a good idea. The lodge is stunning! The decor and comfort are second to none I have ever experienced in other lodges. The heating was perfect and the water pressure in the shower was excellent. The hot tub was warm and ready to go when we arrived. We had a beautiful clear night and the stars were amazing to watch from the warm water. There is plastic glasses provided so you can enjoy a drink whilst in it. All in this lodge was five star. The host was pleasant and well organised. We do a lodge weekend every year as a family tradition and we will certainly come back here! Thank you Ros! This lodge is beautiful and in a gorgeous location. Booking was very easy. Upon arrival we could not believe how gorgeous the lodge was and the views of the mountains were stunning. The place was immaculately clean and all new, the beds were very comfortable and the showers were awesome. The lodge is very cosy and has everything you could possibly need away from home. Really loved the hot tub, so relaxing and secluded. We will definitely be back and would recommend this place for a break away in the Scottish highlands. Beautiful cabin and incredible scenery. .. a lot of care & attention has been put in to create a home from home . The decor is beautiful & the cabin is fully equipped with everything you would need & more . Immaculately clean . This is ideally situated if you want to do nothing but relax in the hot tub or explore the stunning countryside . Cannot rate this high enough, can only say now booked 5th visit ! After searching high and low for a log cabin in Scotland that was central to what we wanted we came across this one. Not the cheapest but worth every penny. Once we viewed the pics on the website we knew our minds were made up. On arrival it didn’t disappoint. The log cabin was truly a home from home with everything you would want or need. The owners were only a call away with a quick response (needed a travel cot and high chair). It was that quite we thought we were the only ones on the site. Brilliant for cycling, sightseeing and relaxing. You will never want to leave! If you stay here, you will never want to leave! My wife and I stayed here for our 'mini-moon' and it really exceeded expectations. The lodges are so well spaced out that you don't feel intruded on at all. Inside, they are decorated immaculately - and even gave us some ideas for how we would like to decorate at home! The whole lodge has a cosy vibe to it, perfect for those long winter nights. Set in the middle of some spectacular views, it's great to relax and take in the surrounding scenery and listen to absolutely nothing! Ros was fantastic during the booking process as we had so many questions as we hadn't stayed in a self-catering place before. She also makes sure that you arrive and that everything is okay, which is really nice and very much appreciated. This was a real find for us, and we will be back! Thank you! This was an amazing place to stay - the lodge was certainly luxurious and the hot tub was a real treat. The whole area was so beautiful - the lochs and scenery and beautiful colours were fantastic. Would recommend this to anyone. Wish we didn't have to leave! The cabin was amazing! So luxurious and well appointed and the place was spotless! We didn't need any of the 'just in case' items we brought with us for a self catering stay. Ros and his wife were very welcoming and made sure we had everything we needed for our stay. The views were spectacular and it was nice and quiet away from the road (which wasn't really that busy!) We had a lovely meal in the Mhor 84 restaurant down the road before turning to prunes in the hot tub after! :-) The location was ideal for day trips around the Loch Lomond National Park, and we even ventured as far as Oban, which was just over an hour away. Can't wait to come back, and are already planning our next visit! Amazing lodge in a wonderful location - perfect! I stayed here with two friends to celebrate our birthdays. We had an amazing, relaxing time. The lodge has everything you would need, is decorated in a tasteful yet luxurious style and has a great hot tub. I would definitely recommend this place - amazing facilities, great views - the owner, Ros, has thought of everything. I'll definitely be back! Exceeded expectations in every way possible. It was superbly kitted out and immaculately clean. The pictures don't do justice! We had everything we needed for a family break. The Hot tub was so easy to use and was a real treat too. It was very private and had wonderful views. We were so impressed with the attention to detail in the design of the cabin and really would love to come back here one day as the area is beautiful too. Ros made us feel very welcome and the information pack emailed prior to the trip and provided in the lodge itself had everything we needed. The great thing about the location is that if you are wanting a break from cooking there are options nearby - Mhor 84 was just down the road and served us very well! Big thank you to Ros for a wonderful vacation! Incredible stay at a beautiful lodge!! Ros went above and beyond to make our stay very special. I had asked Ros prior to our visit that I was planning on proposing to my girlfriend whilst out on a walk at Loch Ard. Ros very kindly organised for some champagne and flowers to be waiting for us on our return, everything was perfect (luckily she said yes!!). Additionally, a private caterer was organised to come in and cook us an amazing 4 course meal, again all down to Ros, all I had to do is choose what I wanted us to eat. It truly was a memorable couple of days. The lodge is immaculate and very tastefully decorated. Is has everything you could ever want and more. The hot tub is a very nice addition after a long day's walking. Location is perfect, very easily accessible from Glasgow airport. I will certainly be revisiting, I hope a regular anniversary location. I urge everyone to do so too. Such a wonderful place and exceptional service. Had a fabulous time here over Hogmanay! Had a fabulous time here over Hogmanay. The lodge is equipped with everything you could think of, from every kitchen item imaginable, torches, top of the range vacuums, gas BBQ, Sonos speaker and a Nest heating system! Really felt relaxed spending our evenings under the stars in the hot tub away from the hustle bustle of city life. Ros helped us with any questions we had and couldn't have been more helpful or friendly. We will be back!!!... We can't wait to come back! I cannot rate this lodge or it's owner (Ros) highly enough. I had read previous reviews which all said it was amazing, excellent etc but nothing could've prepared my partner and I for our break as it was truly stunning and immaculate, I mean Health Department immaculate. The finish was superb and absolutely everything you can think, and some you can't were provided from torches/umbrella's to squirrel and bird food should you wish to feed the local wildlife. The hot tub was very easy to access / use and most welcome after a days walking. The kitchen is fully equipped even down to a selection of flavoured oils for cooking - truly amazing. I booked this a treat for my partner as he spent his childhood holidays at Loch Earn and he was totally blown away (I think I'll be getting a very nice Christmas gift this year :-)). We will definitely be staying here again. Well done Ros and thank you so much for being very accommodating and the wonderful communication. Worth Every penny! Excellent lodge and great service. Great views! The cabin itself is gorgeous! We have just come back from a lovely couple of days. The log cabin is stunningly decorated with tartans, candles and an endless supply of throws and blankets. Ros and Ashley have literally thought of everything you might need and have it there just in case you need it coffee,ice,shampoo,towels,slippers,robes,plastic glasses for the hot tub the list goes on. Unlike most visitors to the Trossachs we were not there for adventure and walks but rather hot tubs and cocktails the trunk filled with games was a nice surprise to entertain us. The beds are extremely comfortable and the showers are lovely and powerful. Special shout out to the resident dogs who were adorable! Thank you once again to Ros and Ashley I can't wait to visit again! ☺️☺️ Hopefully with some sunbathing weather next time! It is decorated to a high standard and offers fantastic comfort! We were all very pleased with our stay and would definitely come back. The hot tub was fantastic and felt very private. Ros was very helpful and communicative before our stay. Our stay was heavenly. Beautiful lodge with all the details carefully thought out and executed. Hot tub under the stars and BBQ with a view... We can't wait to come back! Luxury with a capital L! Just back from staying in this luxury log cabin. Location, very easy to find, an enjoyable drive from the city, 1 hour 20 minutes. When you enter the cabin you are greeted with such beauty. Style and taste, fantastic. Cosy, bright and beauitful. Great to have the en suites which were immaculate, robes and slippers provided, to help you slip into that relaxed mode. The hot spot has to be the hot tube. After I got in I could not help feeling that I had really arrived on my holiday. I enjoyed a lovely walk to one of the local restaurants MHOR 84. Great food and drinks with a pleasant walk back. Comfortable living space and the kitchen has everything you need. It's a must see. Go and experience the luxury. Enjoy it as much as I did! I visited for a weekend from my home in London in July and from the moment I walked in, I could tell I was going to love it. Not only was everything new, immaculately clean and really stylish, there was no skimping on extras like shower gel, shampoo and conditioner but also thoughtful things like cling film and cooking oil was provided. The BBQ and hot tub were brilliant and even the Scottish rain didn't put us off making the most of the terrace. It's in a beautifully rural setting but is within walking distance to a lovely country pub and restaurant (Mhor 84). Think Mr and Mrs Smith boutique hotel meets picturesque Scottish lodge. It's really unique and I'm sure you won't be disappointed. Absolutely stunning & relaxing cabin! A White Stag in Strathyre...really.....yes really! We commissioned a budding young artist from Bearsden, Glasgow, to paint us an abstract for our new 6 berth lodge...check it out....it's the Highland Coo...this young chap has real talent!